I have to say thank you to everyone who recommended CINDER to me. I loved it, you were all right. Fast-paced, intriguing, complicated, gritty world and it is a Sci Fi Fairytale. I have an innate weakness for fairytale retellings and this book hit all of the right notes. It was the Cinderella story (with other fairytales hovering in the background), but at the same time it was its own thing. I have to say that the prince character was a big improvement over any other version I've read or seen. Cinder herself was spectacular. As a cyborg, she is treated as sub-human. She has very little freedom from her stepmother's greed and hatred, but she is resourceful. Living in a future where a horrible disease can kill you at any moment and there is constant threat of war from the Lunar empire, things are looking bleak. However, she still loves her youngest stepsister, has a quick mind, and dreams of escape. A dream that is within her power and ability to achieve. The Lunar queen is powerful and evil and I am really looking forward to what happens next. 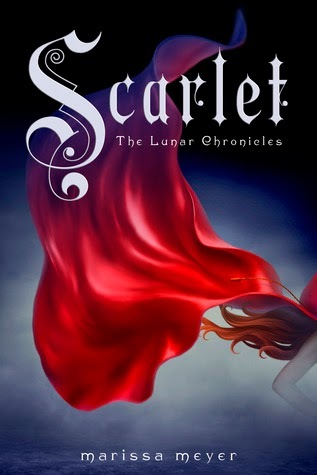 I know I need to get book 2, Scarlet, ASAP, and so many of you have also helpfully pointed out the three short stories also set in this universe. Now let's get to the discussion. As these questions and the answers in the comments will likely be SPOILERY, read at your own risk. Use the comments to add your answers. 1. What were your thoughts on the fairytale retelling? Any bits "too on the nose" or anything you wish had been included? 2. What surprised you, if anything? 3. How many fairytale references did you catch? 4. How about the romance - too much, too little, just right? 5. How about the world - did you feel like you got a good intro? 1. It felt right. I did find myself trying to match up the various players. The fairy godmother (the Doctor), I'm still not 100 % on. He killed a lot of people looking for Cinder. However, this is a series that isn't pulling many punches and I like that. There is a very real sense of danger for the characters. 2. Peony. Oh, Peony. That was heartbreaking and honestly I didn't know the author would go there. I was sad about Iko too, but I had expected that. 3. Other than Cinderella, the Big Bad Wolves that make up the Queen's army, the Wicked Queen from Snow White, with a good dose of Snow Queen too, Rapunzel. Those were the ones that jumped out at me. 4. I thought the romance level was just right. There was obvious attraction, but it wasn't overdone. Also, no triangle. 5. I thought the book did a good job of presenting us with a very gritty world that matched the socio-political issues. At the same time, it wasn't pages of description that got in the way of the story. 6. I need book 2. 1. I agree. I love that even the good guys are not wholly good. The bad guys are pretty clearly evil, so I'd like to hear that the baddies have done good to bring the balance up a bit, but I won't quibble on that. I have a harder time with the goods being too good than the bads too bad, if you follow. 2. Strangely, I forsaw what happened with Peony, but Iko caught me by surprise. Shouldn't have really, Stepmom was vindictive enough, I just hadn't considered it. I'm interested now to find out if the boy Cinder helps in Peony's place appears again in later books. 3. I recall picking up on the same references you did. The stronger Lunars (thaumaturges) strike me as a little Pied Piper as well. I may have noted more in October when I read Cinder,but that's what immediately comes to mind. I've picked up a few more in Scarlet (currently reading). 4. I loved the level of romance. tiny spoiler alert: Thankfully, though there is potential for a Cinder triangle to develop in Scarlet, so far it's been skirted. 5. I liked the world. As you said, enough information to understand without slowing the story. The only part I didn't quite get was why cyborgs were so reviled. They were humans who for whatever reason have been given mechanical parts, but the key part is they were / are human. It's likely that many cases are like Cinder where she had no say in the matter of becoming a cyborg. Is difference the only reason? Realistically, that is all many people need; but, the people who didn't have a problem with cyborgs were in such a minority it made me wonder what caused such widespread and strong discrimination. Maybe I missed something? 6. I have to finish book 2. And now, I have to get the prequels! I was still crushed when we saw what happened to Iko. I just thought that maybe Cinder would be on time with the cure for Peony. I agree with your and Jessie's comment about not knowing exactly why the cyborgs were hated. I think I just accepted it because people as a whole can be horrible to those different from them. As far as triangles go, if over the course of the story another love interest appears, then I'm usually ok with it. Especially in a story like this, where I imagine that things are still strained (to say the least) and they are apart. That's life, you meet new people, and so on. The insta triangle gets to me more. I'm reading the prequels this weekend! 1. I loved how radically different this retelling is! The main elements are there but they are totally original. I laughed at Meyer's version of the "pumpkin". I thought the fairy tale aspects were integrated really well into the story. I almost missed a couple because they were so subtle. I too loved that the characters aren't black and white except Levana and her thaumaturges. Those guys are evil. I was trying to match characters from the fairy tale to characters in the book. I didn't catch that the doctor was the Fairy Godmother. I agree with that observation though. 2. Iko! What the stepmother did with Iko killed me! I was hoping Cinder was going to be able to save Peony but I had resigned myself to the fact that she wasn't going to make it. 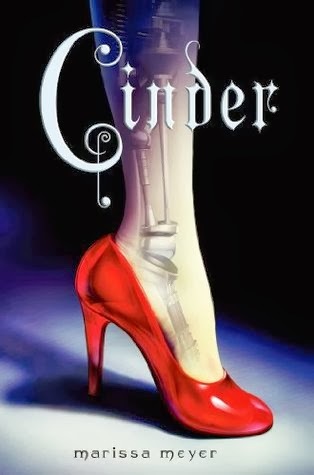 I almost cried when Cinder's foot fell off even though I knew it was coming because, duh!, lost slipper. It was still sad to read how it came about. 3. I caught the same ones you did. 4. I loved the romance! And thank heavens for no love triangle! I am so sick of the love triangles. I really thought the romance was sweet and realistic with how slow it developed. 5. I really liked the world building. Like Ginevra, I was a little confused at all the cyborg hate and why it had started. It is explained more in the rest of the books. 6. I need book 4! This next year needs to go really fast! Iko was my favorite character in the book! I want more Iko. I wonder, is she the android in THE LITTLE ANDROID? I hope so. Also hope that Cinder can get her back. I really liked the Asian twist. It seems like most of the fantasy fiction on the market today is either set in the States or in the UK. This was refreshing, as was weaving some cultural details. YES, and something I should have added in my short review at the start, so thank you for mentioning it. I was surprised on so many accounts. I was not expecting she would able to have so many common references to the Cinderella mythos and yet still surprise me with unique twists. (#4) I wouldn't have thought the level of romance would have appealed to me, but while reading, and in retrospect, it was perfect. Perhaps, because unlike more forced-into-common-romance-novel-arc plots, it seemed more natural to what actually would have occurred given those two characters' circumstances. After just finishing Scarlett, and the thinking of the difference in the two in that regard, it makes me admire this more subtle approach even more. I also liked that it was based somewhere other than America or Europe, and liked that the author didn't try to ram the point down your throat. I *loved* that Cinder was mechanically inclined, and a self-starting problem solver. And that she could occasionally have a little temper, but be so compassionate towards others at the same time. That she was driven, but did have the moments of self-doubt or self-pity that (most) normal people would experience. And then not wallow in them too long, but knock it off and dust herself off and keep moving forward. There were only few points I thought were odd. The 'pumpkin' was set up, but didn't really have any great payoff, IMHO. The only other, as I saw at least one other reviewer mention - she called it the Eon syndrome - was that it became annoying that after revelation of many fects that should have easily added up by the end, neither Cinder or Kai (Duh, Kai. Really? And you've just recently been searching aaaaaaall over for for her?) jumped to the logical conclusion. And was nearly driven mad when it ended and I was going to have to read the next one to find out what would happen with them. Plus, the next book seemed to start off never mentioning her and developing an entirely new heroine. The Peony development did startle me, but I actually like the choice the author made there, when I consider it more broadly. PS - Thanks for hosting this! I've been itching to discuss with someone after finishing it. The only thing I liked about the pumpkin was that it did illustrate Cinder's mechanical brilliance, and that she really probably could have escaped in it, had she made another choice. I did realize that it was a plot device for Cinder to feel she was responsible for Peony's situation, by taking her there. It was also a cute way to orient us in time, our time versus theirs and all the progress since (kinda reminded me of the Sandra Bullock character in Demolition Man fascination/attachment to 'old' things). More specifically, I guess my reaction was just based from "What?! All that work and time and it just ended up crashed!? D'oh!". I guess I didn't see beyond that - what my own frustration would have been - to see that it was representative of her giving up her former, more self serving goal, in lieu of a more responsible, utilitarian goal. Which is a great point. Now that you mention it, I can imagine we'll keep seeing her being put in situations like that, with similar choices, as she grows into(/ is forced into) her new role.